For the array of radio telescopes, see MERLIN. Merlin is a legendary character. He is best known as the wizard in the Arthurian legends. He was King Arthur's guide. Merlin is always a mysterious figure. He rarely gives his reasons for the things he does. 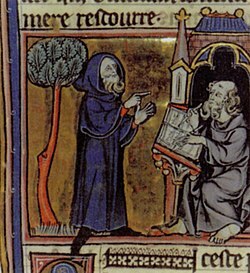 Merlin was probably first written about in Welsh legend. His story is based on parts of several different real and fictional characters. Merlin is usually said to be one with nature, being the source of his enormous power. The Lady of the Lake enchanted him. This page was last changed on 27 December 2017, at 02:43.